Stocks continued two familiar recent trends this week: increased volatility and continued weakness. The S&P 500 fell 2.77% for the week and is now down 3.10% year-to-date. The tech heavy Nasdaq Composite has fared better, declining just 2.13% and 2.58% for the week and year-to-date, respectively. The industrial laden Dow Jones performed the worst for both periods (down 2.87% for the week and 3.69% year-to-date) since export-driven industrials have been the hardest hit by a strong dollar. Intermediate and long-term Treasuries also extended their recent rallies this week, pushing the yield on the 10-year below 1.70%. This is the lowest level witnessed since mid-2013. On Friday, the U.S. Commerce department fueled the stock market declines by issuing 4th quarter GDP growth of just 2.6%, below expectations and far below the 4.5-5% witnessed during the prior two periods. While lower oil prices drove an impressive 4.3% rise in household consumption, the stronger dollar is creating a tough headwind as net exports cut one percentage point from growth. Lower government spending acted as a drag as well to the tune of 0.4%. The consumer spending data was the strongest since early 2006. One trouble spot was nonresidential investment, which added only 0.24%, the lowest figure in nearly two years. 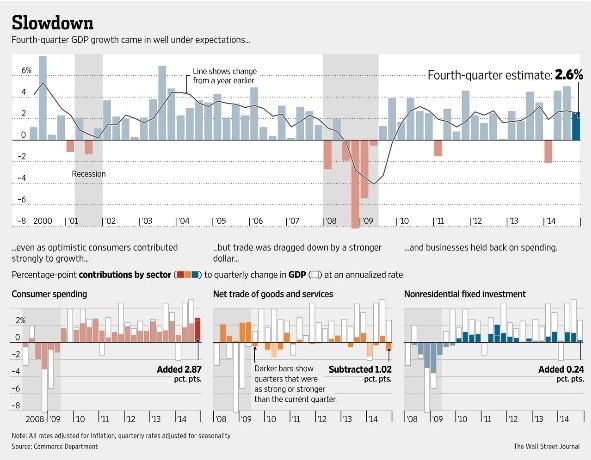 The fourth quarter measurement put GDP expansion for the entire year at 2.4%. 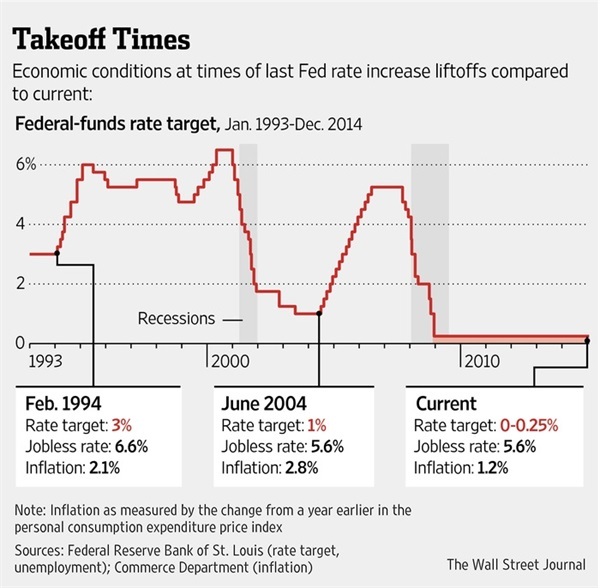 The Federal Reserve again reiterated that it will be “patient” about raising rates in a statement released Wednesday. In December, Fed Chair Janet Yellen explained “patient” suggests no rate hikes for at least two Fed meetings, implying no rate hike until at least June. The Fed’s statement provided an optimistic outlook for the domestic economy citing a “solid pace” of expansion. Interestingly, there were no dissents during this vote, largely due to the more dovish makeup of the voting committee after retirements of two noted hawks and the usual annual committee turnover. Another important nuance of the statement was the addition of two words: international developments. The Fed added this to the list of things it is monitoring, perhaps opening the door to continue with easy money if continued dollar strength pressures growth. * Indices are unmanaged and cannot be invested into directly.